Squash House Quilts: My Unplanned Hiatus is Over! My Unplanned Hiatus is Over! Not only did many of you wonder where I went the past three weeks - so did I! I'll have to chalk it up to an unplanned hiatus. After helping Mr. Squash prepare for and successfully recover from back surgery, I somehow felt a need to cocoon and hide from the "outside world". Actually, when I think back, this whole year has been a whirlwind of moving, unpacking and settling in to the Squash House, so I think a little break was well deserved - don't you? Thanks to so many of you for your kind emails checking up on me! I appreciate it more than you know! While I was cocooning, I was having some fun! At the Portland Quilt Show I came across a wonderful wood craftsman, Phillip Galyon, of Wooden Images in Tualitin, Oregon. He makes and sells all kinds of furniture including sewing cabinets and quilt racks. I had been looking for a rack to hang inside our front entry to display quilts for some time. Phillip sat down with me and we came up with a custom rack, perfect for the entry. Here it is...with the first display! The rack is made of Alder and stained in a golden oak color. It also has a 4 inch wide shelf on top to display knick knacks. When it arrived, I immediately made a sleeve for one of my fall quilts to display through Thanksgiving. The next day I was in a little gift shop downtown and saw the adorable "Harvest" sign - just perfect for the shelf. Click on the photo to get a better look! I've also been sewing up a storm in my studio. I thought it prudent to have quilt tops ready for Lenni, so I've been hard at work! I still don't know when Lenni will arrive, but hope to hear from Heidi any day now. This is my Christmas Tree Skirt flimsy. I began quilting it on my Bernina yesterday - just a simple cross-hatch throughout. I didn't want to wait for Lenni because I hope to have our tree up the first week in December. After it is quilted, I will then cut the opening and attach the binding. I think it's really going to be gorgeous! 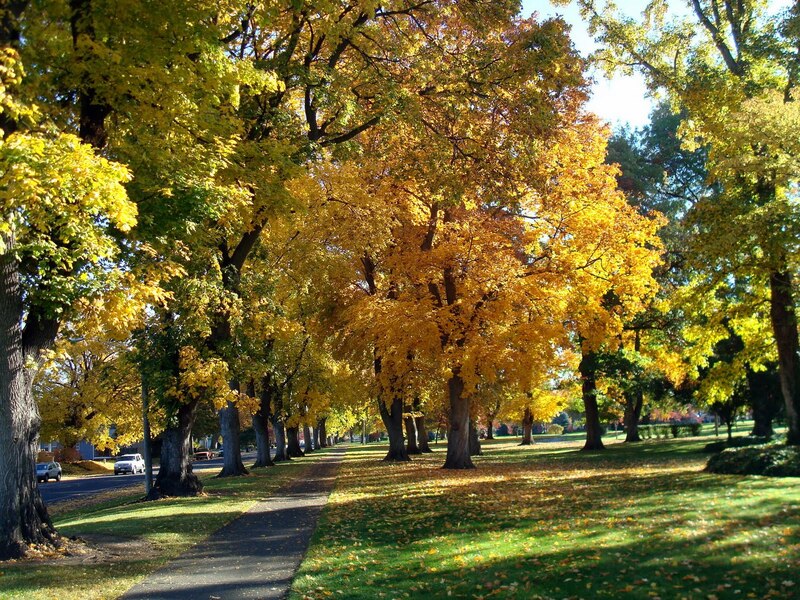 We've had some spectacular Autumn weather the past month! My daily walks, sometimes with Mr. Squash at my side, have been quite a treat! These photos were taken in Pioneer Park which is only a block and a half from the Squash House! The trees above are a mixture of Elm and Maple and are at least 100 years old! 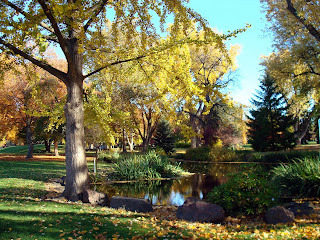 This is a little pond in the park which spills into one of the many streams running through town. It's usually filled with Mallard ducks and if you walk right up to the edge some very large koi will come right up looking for a treat! Suddenly yesterday, all that beautiful Autumn color was replaced with something else - the first snowfall of the season! 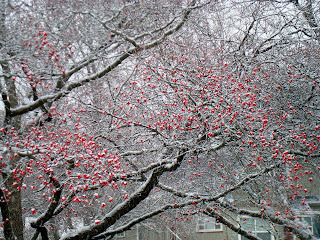 This is one of our Dogwood trees just a bit after the snow began to stick! We got a little over an inch when it stopped. Today we're supposed to get up to 4 inches! Come back Wednesday when I'll have some more finishes to show! Candace..welcome back we all need a little hiatus now & then. 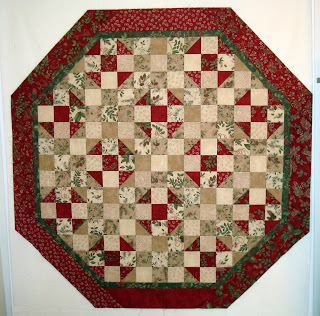 Your quilt rack is beautiful as is the quilt hanging from it and your tree skirt well it is too Wishing you & Mr. Squash a very Happy Thanksgiving! Candace, I just love that shelf! It's perfect for that spot! I may need to look into getting one myself! I especially love the quilt hanging on it! Way fun! I love your tree skirt! Colors are gorgeous! Still can't wait for you to get your Lenni! Welcome back and thanks for sharing scenes of the season. Your quilt rack is wonderful, as well as the quilt it holds! Have a happy Thanksgiving! Yes, a gal does deserve some down time for sure!! Glad Mr. Squash is doing good. What a wonderful quilt rack! To me, there is nothing more beautiful that a tree dusted with snow! Just stunning! I also love the scenery you get to view on your walks. I look forward to seeing more of your new town through your eyes. Your break was well deserved! And I LOVE your dogwood dusted in snow. I keep hearing about all this snow, but we only saw a small flake or two in our neighborhood. I'm hoping we'll eventually get more than a flake of snow. Happy Thanksgiving! Glad you got a fun break from things! I woke up to snow this morning! Yay, now I don't have to go to work and I can sew all day!!! Love that quilt rack by they way. It is especially made beautiful by the treasures you added. What is the pattern for the tree skirt and what size is that?! Every flippin year I want a new tree skirt and never get to it. I pull out the SAME ONE I made the first year we were married and I'm tired of it. My husband doesn't want me to change it...I guess it means more to him? I don't know...I just know I love the skirt you made and am so glad to see you back to posting again. You were missed!! The quilt rack is wonderful, I love the detail on the ends, something I haven't seen done before. The quilt is also great. Love love the tree skirt. Isn't it something to get this snow now. Welcome back. Great photos of nature, love the winter scene. Your quilt rack is lovely, looks easy to change out the quilts. Missed you! Welcome back. Your quilt rack is delightful. Happy Thanksgiving. Welcome back! So good to hear you are both OK. Your quilt rack and shelf is beautiful, and so is the quilt. Your tree skirt will be so pretty! 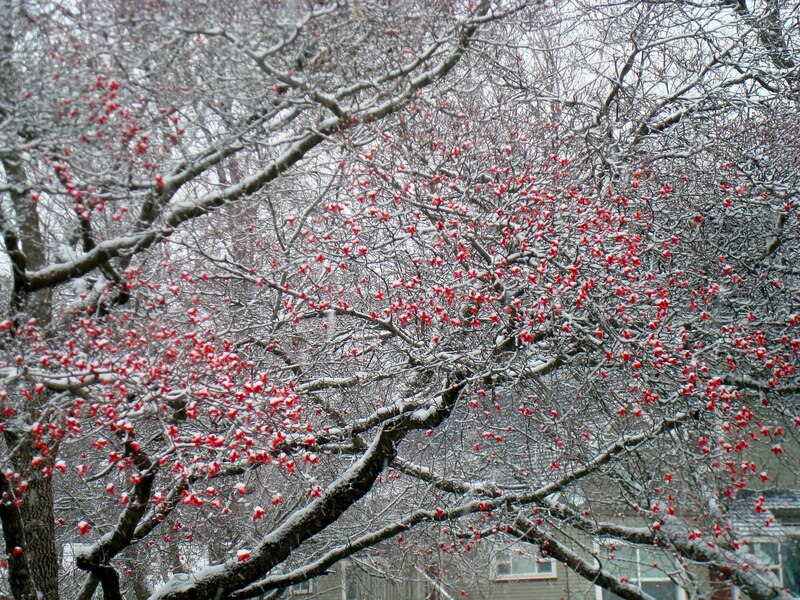 I love the red berries with snow, lovely picture. So glad Mr. Squash is on the road to recovery. Love your shelf and your tree skirt is beautiful. Happy Quilting! We're enjoying "warm" weather in Ohio before the snow arrives. Love the snowy tree photo. 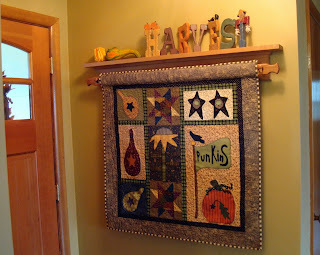 Your quilt rack is really pretty and looks great with your fall quilt and the Harvest lettering. So glad to know that Mr.Squash has been doing well. Best wishes! 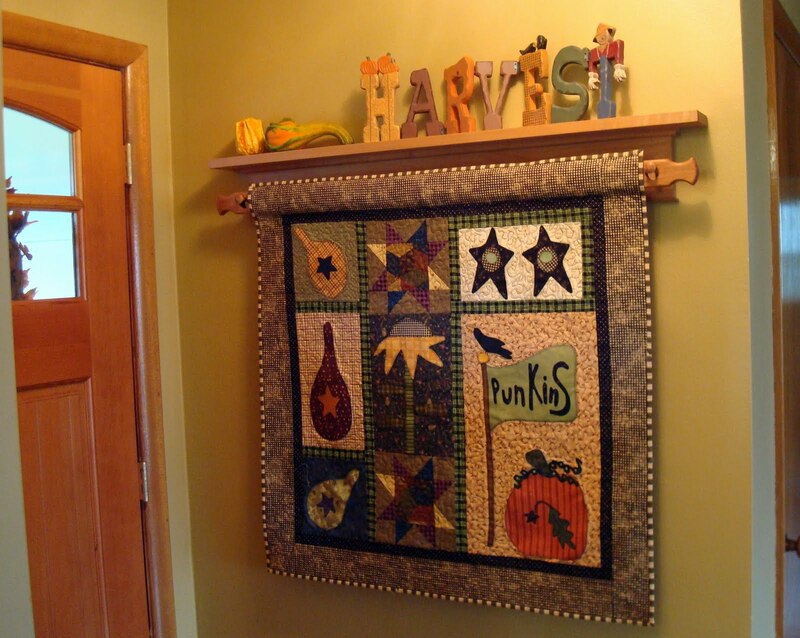 That spot is so cute to hang your seasonal quilts... warm and inviting! Great rack! 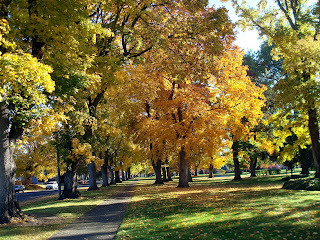 Beautiful pictures of the Autumn trees... what a treat to be able to go for walks there! The winter scenery is looking so beautiful too. Hard to believe it is already snowing for you. Happy Thanksgiving! So glad you are back and Mr Squash is doing better. Oh, how I would love to have trees like those. Don't see much of that in SoCal. Unplanned Hiatus is the best kind. I'm only surprised that it didn't happen sooner. 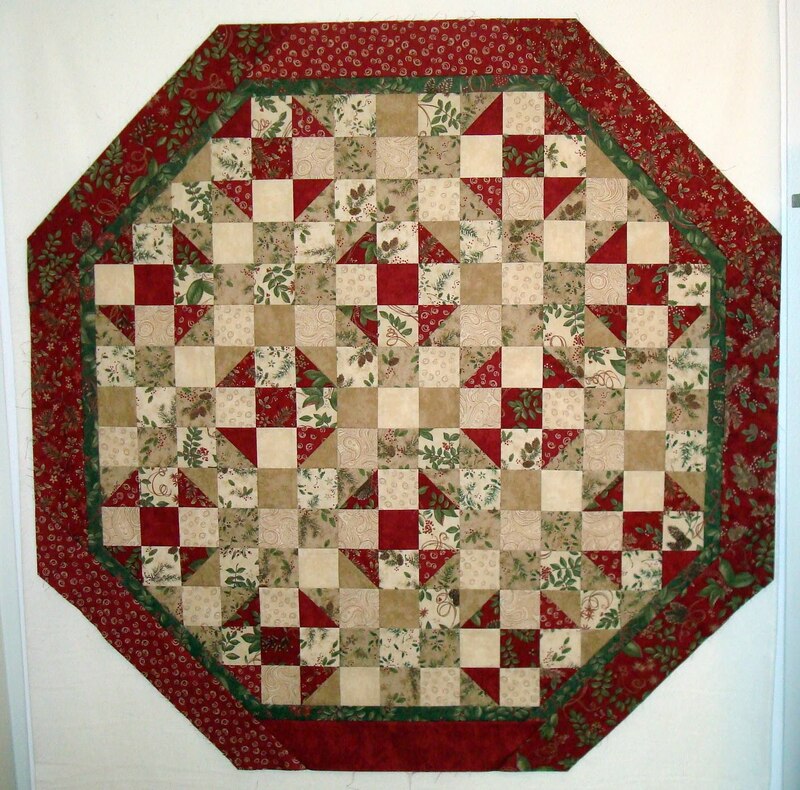 I absolutely adore the front hall quilt and hanger! Wonderful. So happy to hear that things are going so well there. I know you'll enjoy the fresh snow and will have no problem with no more moving or unpacking this winter - hurray!! Did miss you, for sure, but glad the wondering what happened is over and it wasn't anything awful! Lots of good things happening at your place. So nice to hear from you again. After the year you have had you certainly deserve a hiatus..but you were missed. Love your new wood treasures and also your fall quilt and your tree skirt. I wasn't going to say anything about the opening..I just knew you had a plan..You are going to have so much fun on your Lenni when he arrives but I am guessing we will not be hearing from you too much. But that is okay because we know you will be having lots of fun..and besides you will have to come up for air once in awhile. Have a blessed Happy Thanksgiving, yor first in your new home right? Your tree skirt flimsy is just gorgeous Candance! So glad to have you back. Sometimes it is good to take a break. The quilt rack is fabulous. A very nice display. The tree skirt will be so pretty under your tree. A Bitty Project and Sweet Ingenuity! Happy Thanksgiving and Baby Rose Finish!